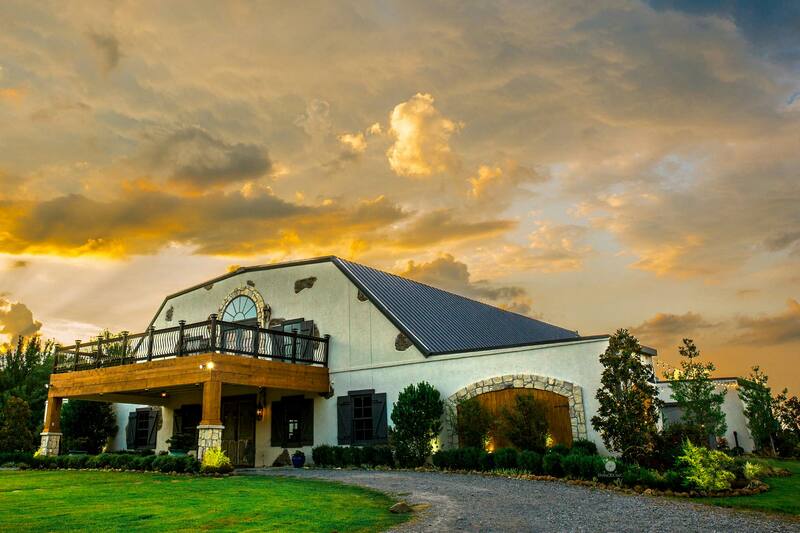 Nestled on 76 majestic acres of Anna, Texas countryside, the River Road Chateau – Outdoor Wedding Venue North Texas offers the perfect blend of classic elegance and rustic Texas chic for both indoor and outdoor wedding ceremonies and receptions. Our near-4000 square foot Great Hall can accommodate up to 200 guests below soaring ceilings with massive, wrought-iron chandeliers. Open-air patios, complete with decorative fountains, sit to either side and look out upon fertile fields and a thriving orchard with productive apple, peach, and pear trees. From the Great Hall, the Bride is whisked down the Jasmine path, across the Bridal Bridge, to our Wedding Meadow, a quaint, shaded clearing surrounded by Pecan, Oak, and Sycamore trees. Here guests will sit on Mahogany chairs, amongst the beauty of nature, as they witness the Big Day. Located just 15 minutes north of McKinney in the DFW Metroplex, our wedding venue is perfect for your country-elegant wedding. Brides have the option to choose from our Preferred Vendor List or select their own with no associated fees. Come see for yourself how the beauty and flexibility of River Road Chateau allows you to create your perfect wedding!